Alenia Aermacchi has thus far sold about 2,000 trainers to more than 40 countries and has collaborated in major international military programs. In July 2003, Alenia Aermacchi was integrated into the Finmeccanica Group, which increased its shareholding to 99%. The company's facilities are located at Venegono Superiore (Varese province). Its workforce totals about 1,800 and plants occupy a total area of approximately 274,000 m². Facilities include laboratories and workshops for structural tests and a wind and a water tunnel in addition to an airfield for flight test activities. For Panavia Tornado, Alenia Aermacchi designs and produces wing pylons and wing tips, roots, trailing edges and flaps, which represent a 5% share in the overall program. In the Eurofighter program, Alenia Aermacchi has a share exceeding 4% in, for the design and development of wing pylons, twin missile and twin store carriers, ECM pods, carbon fiber structures and titanium engine cowlings. After participating in the G-222 transport aircraft program, the company is currently involved in the new Military Transport Aircraft C-27J Spartan, for the production of outer wings. Since the mid-1990s, Alenia Aermacchi has participated in various programs concerning the supply of engine nacelles for civil aircraft. Its design and technological capabilities have permitted the company to produce cold parts for engine nacelles: inlets, fan cowls and EBU, the systems-to-engine interface. In 1999, Alenia Aermacchi established a joint venture (MHD) with Hurel-Dubois (presently Hurel-Hispano, of SNECMA group), a French company specialized in the development and manufacture of thrust reversers, to obtain the full responsibility for the development of nacelles installed on max. 100-seat aircraft. Soon after World War II had ended it was decided to start peacetime production with a three-wheeler truck. This was an unorthodox but very good design. Then, anticipating the motor cycle boom and intending to have a stake in it, the Aermacchi chiefs looked for a good designer who could produce an attractive lightweight. Their choice was Lino Tonti, who had been at Benelli and had worked on aircraft engines during the war. Tonti designed a 50 cc motorcycle that broke the land speed record for the displacement. The bikes produced by Aermacchi were quite successful in the postwar Italian market, also thanks to their repeated placements on the race tracks. The firm designed and produced models incorporating the Italian word "Ala" (wing) in its names, such as "Ala Verde", "Ala Blu" and "Ala d'Oro" (respectively "green wing", "blue wing" and "golden wing"). 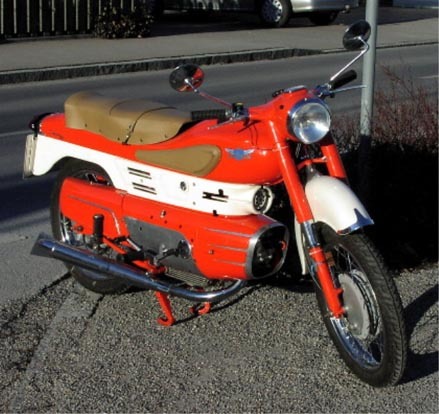 In the 1960s, 50% of Aermacchi stock was acquired by Harley-Davidson to produce, in its assembly plant at Schiranna (near Varese), several models of small bikes (with engine displacement between 125cc and 350cc) for the American and the European market. This was an attempt to take back market sectors that were at the time increasingly being taken by Japanese manufacturers such as Honda and Yamaha. Aermacchi went on to have success in the Grand Prix motorcycle racing world with rider Renzo Pasolini finishing 2nd in the 1972 250 cc Roadracing World Championship. After 1974, when the American manufacturer acquired complete control of the Italian company, Aermacchi bikes re-badged as Harley-Davidsons won the 250 cc Roadracing World Championship three years in a row in 1974, 1975 and 1976. They also won the 350 cc World Championship in 1976. Upon the acquisition of Harley-Davidson by AMF in 1978, the Italian operations of the firm were sold to the Castiglioni brothers, founders of the Cagiva motorcycle company, which continued to produce bikes branded "HD Cagiva" until 1980.